For most early pragmatists, including the founder C. S. Peirce and L. Wittgenstein, vagueness was a real and universal principle and not a mere defect of our knowledge or thought. This volume begins by exploring this pragmatist notion of vagueness and the way it was tied to their basic opposition to various kinds of reductionism and nominalism. It then develops towards an analysis of Peirce’s original and wide views on vagueness, as seen through the angles of logic, semiotics, epistemology and metaphysics. 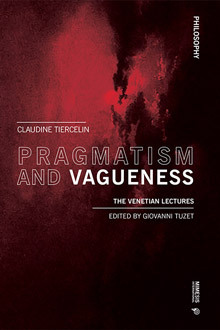 In the final part of this book, the reader is presented with a case for the contemporary relevance of such a realistic pragmaticism for the ongoing debate on semantic, epistemic and ontic vagueness. Claudine Tiercelin is a French philosopher, working on metaphysics and philosophy of knowledge. She is Professor at the Collège de France, Member of the Institut de France (Académie des Sciences Morales et Politiques). Her publications include the books La Pensée-signe (1993), Peirce et le pragmatisme (1993), Hilary Putnam, l’héritage pragmatiste (2002), Le doute en question : Parades pragmatistes au défi sceptique (2005) and Le Ciment des choses (2011).